This blog entry is the beginning of my planning page "Disney Planning and Touring How To Guide". I will be posting a little bit at a time to the home page. If you'd like to read the touring page in its entirety now you can click here to view it. Planning your Magical Disney Vacation is a big part of the fun! Even experienced Disney folks like myself spend a good deal of time planning out a trip. I've jokingly often said "If you are not prepared, Disney World will eat you alive". This page is designed to help you avoid that, and develop a plan! Do not show up to Walt Disney World with the idea you are going to "wing it", especially with kids. If you do "wing it", do not complain about your trip when you return. You have been warned. Decide which park you are going to on which day of your trip and make dining reservations appropriately. Use EMH mornings if you are a Disney Resort guest, avoid all EMH if you are off property. Use Disney's FastPass system to your advantage. Disney is not the time to sleep in. Get up and be at the parks before they open. Take a break in the afternoon. Decide which attractions you want to hit and have a touring plan for each day. If you have already seen the parade or fireworks once, skip them the second time and hit the rides with low crowds. Consider a subscription to TouringPlans.com. Full price will cost you around $11, but it gives you access to crowd level calenders, daily touring plans for all types of vacationers that you can print out, and access to their smart phone app that gives you in park wait times. It's worth every penny! Think about what you would do if you didn't know any better. That's what everyone else is doing, so do the opposite! Hello. I’m Marge, Disney pro and a runDisney enthusiast. This fall, I will be participating in the Disney Family 5k, my fourth Disney sponsored race—not too bad for someone who has only been running for three years and is not a local resident. 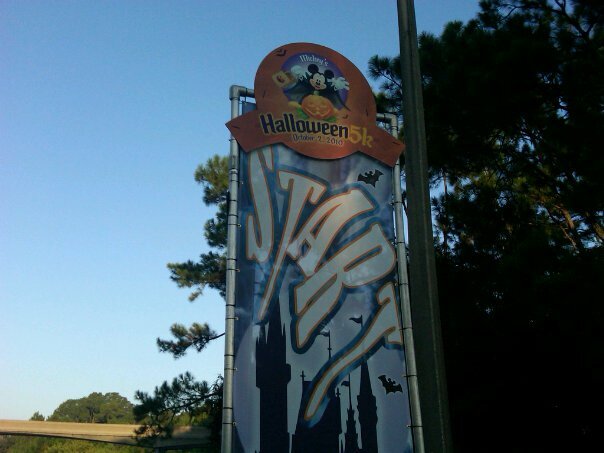 I thought with the Disney Wine and Dine Half Marathon Weekend only six weeks away, I would share my experience from last year’s Halloween Family 5k, in hopes to answer any questions new participants may have. First off, yes I am crazy. During last year’s Wine and Dine Half Marathon Weekend, I participated in both the Halloween Family 5k and the half marathon on the same day. It was an amazing experience, probably would have been more enjoyable had I not been six weeks pregnant and suffering from horrendous morning sickness (don’t worry, my doctor gave me the okay to run both races). I was quite excited for the 5k, as I would be participating with my two boys, my husband, and my dad. This race was to be my son, Nolan's (age 6) and my dad’s (age 56) first ever 5k run and it was my son, Nathan’s (age 10), first race after breaking his foot over the summer. The day started out way too early, as we arrived to our Disney resort very late the night before. Getting checked in and four kids settled for the night is no quick task. By the time we were able to close our eyes, it was mere four hours before the alarm would be brutally tearing us from our restful slumber. It's not too late to register for the 2011 race! We knew we would need to take a taxi from our resort to the start line at the Ticket and Transportation Center. Transportation was only provided from select host resorts. This is true for all Disney sponsored races, so it is a good idea, before you even register, to make a transportation plan. You don’t want to wake up on race morning expecting to take a Disney bus to the start line only to discover the busses do not run that early. The night before, I checked with Bell Services to see if I needed to call for a taxi in the morning or if there would be a few waiting in front of the resort. I was assured that there would be plenty of taxis available early the next morning. Much to my dismay, there weren’t ANY taxis outside of our resort that morning. However, the gentleman at Bell Services quickly phoned the company and a taxi was there within minutes to take us to our race. While waiting, I wanted to confirm the location of the start line (I was certain as to where it was, as I had my pre-race instructions in hand, but I always like to double check). When discussing the race details with the gentleman from Bell Services, he informed me that the start was at Epcot. So of course, I panic. I have instructions in my hand that tell me one thing and an employee telling me another. I thanked him for his help. After a minute of deliberating, I decide to go with my gut feeling and trust my pre-race instructions. So off we went to the Ticket and Transportation Center (unfortunately the taxi driver had no idea where to take us….but that is a whole ‘other story). My instincts proved to be right. We immediately saw the crowd as we approached the center. This was a good lesson: Always know where the start line is located before you venture out. My guess is the Bell Services guy was looking at the Wine and Dine Half Marathon (which was later that day) information, which did in fact require participants to board a bus at Epcot. We immediately located the packet pick up area and were able to get our packets, affix our race bibs, and check our bags very quickly. The bag check was most convenient. No one wants to have to run with their room key and cell phone, let alone that plastic bag that contained all of your race things. By the time we had all made one final “pit stop”, it was time for us to line up. The Family 5k was not a chip timed event. This means that you are not competing for anything, it is really just for fun. However Disney does require a 16-minute per mile pace and if you are unable to maintain that pace, you will be picked up and transported to the end of the race. Disney’s pace requirement is more generous than most 5k races in order to allow participants to stop for character photos. We don't know these folks, but don't their costumes look great? We were well entertained during our wait for the start. There were so many unique costumes. I was actually surprised by the number of participants in costumes. Personally, I get too hot and sweaty while running, but if the mood should strike, and you wish to wear a costume, rest assured you will not be the only one. Just remember, Disney will not let you run with a mask. That is for safety reasons and quite honestly, masks are creepy anyway. The appeal of doing this race, other than the obvious “I’m running at Disney World and I get a really awesome t-shirt that I can use to brag to all of my friends back home” appeal, is that the race course took you through the Magic Kingdom. There were of course, along the way, many opportunities for a meet and greet with beloved Disney characters. There were quite a few Disney Villains on the course, keeping with the Halloween theme. The main appeal, at least for me was being at the Magic Kingdom while the park was closed. Even with all of the participants, the park seemed empty, quiet, and pristine. It felt as though you had the park all to yourself. It was really a unique way to experience the Magic Kingdom. Even though I was running, I could see things without the distraction of hundreds of people in front of me and was able to experience the park in a way that I had never before. The author and her four "Prince Charmings" after their 5K. Upon crossing the finish line, it was quite easy to find my dad and Nolan (they had run ahead of us), which was great because we did not designate a post race meeting spot. When all of us were reunited, we were able to get a post-race photo of all of us with our medals. The post race refreshments were decent. There was plenty to drink, bananas, and we each received a bag with some candy and a muffin. Our transportation back to Jambo House was covered by Disney since the busses were then operating. It was a quick monorail ride to the Magic Kingdom where we were then able to board a bus back to the resort. It was a fun experience, so fun that we have signed up to do it again this year. This year’s course, however, takes you through Animal Kingdom. Having run another race through Animal Kingdom at night (Expedition Everest Challenge, 2009), I am excited to see what it will be like to run through during the day, although I am sure that no other race will ever compare to running through the Magic Kingdom. Sign up EARLY. Races tend to sell out quickly. At the time of this post, the 2011 5k is 60% full. Read and re-read your pre-race instructions. Print out a copy to take with you to the race (you can toss it out when you get there). That way you know, without a doubt, where you’re going and when to be there. Make a transportation plan if you are not staying at a host resort. Utilize the bag check area. That way you do not need to run with, or worse lose, your “Key to the World” card and cell phone. Make sure, if you are running with others, that you designate a meeting place at the end. You don’t want to miss your post-race photo opportunity to capture this experience. Have fun and savor this experience—it will be like no other. Faith Trust and a Little Pixie Dust would like to thank guest blogger Marge for her contribution. You can see myself, Marge and our families at this year's 5K. You can find Marge on Twitter at @RNawaymama. 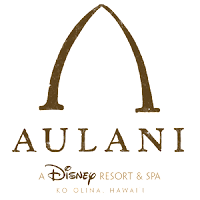 In just a few weeks Disney is set to open its newest resort, Aulani Resort and Spa on the island of O'ahu. This is actually Disney's third resort that is not connected to a theme park. Disney also owns resorts on Hilton Head Island in South Carolina, and Vero Beach in Florida, about a two hour drive from Walt Disney World. 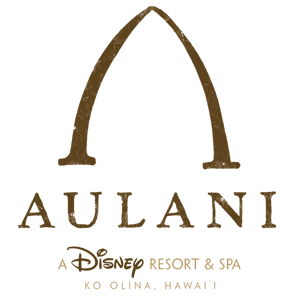 Aulani is located at Ko'Olina on O'ahu's leeward side (west) and will have 359 resort rooms, 460 Disney Vacation Club (DVC) villas, 4 restaurants, a private snorkeling lagoon and activities galore for adults and kids. Whew! That's just the beginning! My husband and I were recently on the island of O'ahu, and of course I HAD to see Aulani. While the resort doesn't open until August 29th, like all good timeshares, Disney has a sales office on site. Sales presentations are available to the public and DVC members. 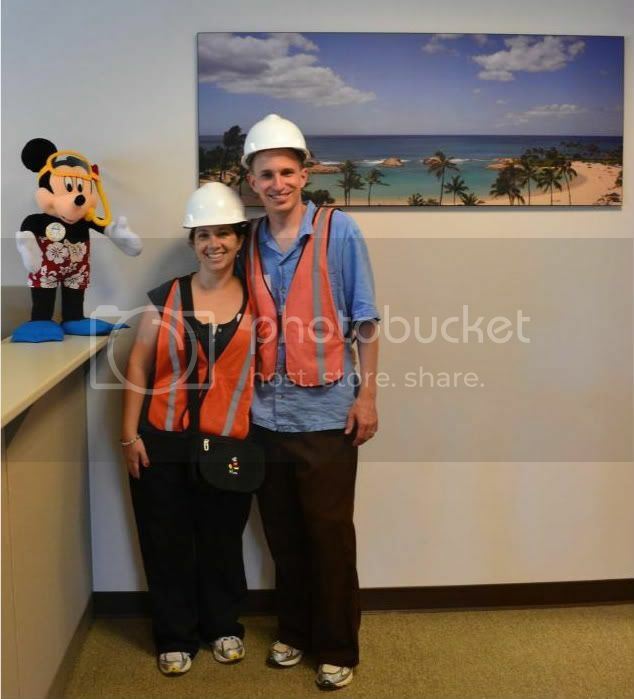 We are DVC members at Animal Kingdom Villas, and I called the day before to arrange the visit (technically its a "sales presentation"). Aulani as seen on the drive up. The drive to Ko'Olina is about 30-45 minutes from the downtown Honolulu/Waikiki area depending on traffic. It took us about 30 minutes during a non-rush hour time. The building itself is massive, and you can see it from the highway from quite a distance. According to the driver from our sunset cruise later in the week (a Hawaiian rumor mill version of a WDW bus driver), the road was recently repaved in anticipation of Aulani's opening. As a matter of fact, shortly after the Ko'Olina exit, the lovely fresh pavement ends! Once you do take the exit, you are brought to an actual gate to the entire Ko'Olina complex. They didn't seem to be at DEFCON 2, but they did ask where we were headed. At one time Ko'Olina was forgotten marshland, but it is now a planned complex that hosts a public beach, a golf course, condos, the Ko'Olina Beach Villas, Marriot's Ihilani Resort, and several shops and restaurants. While the DVC preview center is now open inside the resort itself, our tour was scheduled for the last Friday before they moved in, so our tour originated in a suite above the Hawaiian BBQ restaurant. Our guide (Disney talk for timeshare salesperson) was Andrea, and we liked her very much. We were offered soda or water, and led to a sales office. While waiting for Andrea we were able to view a short video on the new resort. While I don't have access to that video, below is a neat video from You Tube that shows many of the artist renderings and a virtual fly over of the resort. I will say that the virtual images do not do the resort justice. The pool area in person was fantastic. You will need to pause the music from this blog at the bottom of the screen or you will be bombarded by both audios simultaneously. After some small talk and our introductions to Andrea, we were introduced to our fabulous, high fashion, OSHA approved, construction zone attire. They had told me I would need closed toe shoes (I had thankfully brought sneakers for hiking Diamond Head), and long pants. Who brings long pants to Hawaii? Not us apparently. Andrea took us on a quick spin in the golf cart over to the front of the resort. Unfortunately, they requested that we not take photos of the grounds or resort other than the room. I can tell you that it was very impressive. As per usual Disney standards, the landscaping was lush and coming together quite well considering the resort doesn't open for another month. There was a small water feature in front, with torches lit with Hawaiian kukui nuts. Andrea informed us that this was a traditional use of the nuts in early villages. The entrance to the resort and the lobby reminded me quite a lot of Peter Dominick's Animal Kingdom Lodge and Wilderness Lodge. The size however, was smaller than I had anticipated from the artist renderings. It was on a scale closer to Kidani Village than Jambo House. Lighting is one of my favorite aspects of Disney Imagineering, and Aulani did not disappoint. The interior of the lobby was illuminated with hanging lanterns designed to look like Hawaiian ipu gourds that were traditionally used to carry water. The photo below was the best I could find of something similar. We were led past the check-in desk toward a model room. Behind the desk is an arrangement of many smaller pieces of art that were contributed by Hawaiian children specifically for the lobby of the resort. Opposite the desk is a children's waiting area with a TV that will show Disney cartoons to keep the kiddos busy while you get checked in to the resort. Anyone want to bet on "Lilo and Stitch"? While walking toward the room, my husband was already scoping out Hidden Mickeys. Apparently, while unannounced to me, we were having a contest as to who could spot the first one. Guess who won? Since much of the art of Polynesia is more angular than curved, this poses more of a challenge to the Imagineers. We did find, in several locations a possible Mickey whose validity was much debated by my hubby, myself, and Andrea. It was however, made up of three squares, rather than three circles. All three squares were standing on their corner, but it was obviously one large square, with two proportionally smaller squares above and to the sides. For the sake of marital harmony, we decided that it was, indeed, a Mickey. Then, finally, THE ROOM! We were shown a 2br suite on the north side of the resort. We were both very impressed, and felt it cozy and comfortable with many touches of Hawaii and Disney. One word of warning, if you do not like dark rooms, such as Animal Kingdom Lodge, you may not like the lighting in these rooms either. While we really appreciate the dark comfort of those rooms, many do not. We felt the overall feel of the room reminded us quite a bit of Animal Kingdom, and given that Joe Rhodie was the Lead Imagineer of both Animal Kingdom park, and Aulani, I guess that's not too surprising. Studio bedroom. I like the two different colored walls. Hidden Mickey anyone? Nifty lamp on the left portraying a surfing Mickey. This space felt crowded. Other portion of the studio with TV console and sleeper sofa. Full kitchen and banquette with view into studio. Hidden Mickey anyone? Full kitchen and tableware. Over the table lighting is of the same style as the lobby. Flat screen TV in main living area with a view into the studio. The lanai is to the left. The TV cabinet is actually a murphy bed in disguise! Master Bedroom. My husband loved the Hawaiian quilts. View from the master bedroom into the master bath, leading back toward the main entrance and kitchen. Glassed in steamer shower with built in seat in the 1 and 2 bedroom villas. My hubby's favorite part. Bathroom in the studio portion of the room. View into the master bedroom from the bathroom. During our tour, I spoke to our guide about some of the features and amenities that will be available at Aulani. While there will not be a Magical Express, Disney will have contracted transportation available, similar to the Disneyland Express in California. One of the four on-site restaurants will be a family friendly buffet featuring character meals. As is common in Hawaii, Disney will contract with local tour operators and guests will be able to sign up for many different types of excursions such as island tours, snorkeling tours and the Dole Plantation. They will also offer Adventures by Disney tours of their own, and while pricey, are unique and should be outstanding. From the balcony of the model room, we were able to get a good look at the pool areas. The lagoon did seem rather small to me for such a large number of rooms. In addition to the private snorkeling lagoon was a very large pool with two volcano themed water slides, a large kids water play area, a lazy river, and a conservation pool that you can snorkel in (with reservations). Although the lagoon was small, the overall water recreation area was quite large. What impressed me most was the activities for teens, tweens, and the kids. Named Aunty's Beach House, this supervised clubhouse for children ages 3 to 10 will be part of your resort fee! While some extra special programs or crafts may have an additional fee, the main part of the club will not. The club will have video games, movies, dress up areas, and an outdoor play area. Tweens will have special tween only movie nights, and special activities just for their age group. Teens ages 13-17 can hang out at "Painted Sky", a teen only spa. More than a spa, it also has video games, a juice and yogurt bar, and will host teen only events. With all these activities for the kids, mom and dad can actually enjoy a dinner or swim to themselves. One of my favorite little details of the resort are the menehune. The menehune are part of Hawaiian folklore. They are magical little people who sometimes like to play tricks on you. Think mischievous Hawaiian smurfs. Only not blue. Anyway, you get the picture. Disney has hidden statues of these little guys throughout the resort in easy, and not so easy to find places. Hopefully you will continue to find new ones throughout your vacation and on subsequent vacations. What does all this cost? You probably don't want to know. A standard room runs in slow season from $399 and up. Yikes! 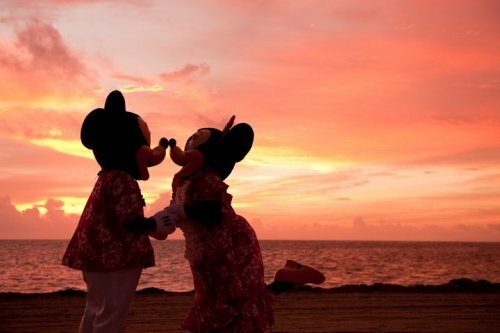 But already there are specials and discounts available, but Aulani will not be for those on a tight budget. A studio villa with a parking lot view at the slowest time of year will run you 126 points for the week. A 1 bedroom ocean view room will cost you 322 points for the same week. In comparison we can get a 2 bedroom view of the savanna at Animal Kingdom Lodge during that same week for only 272 points, and fly all five of us to Orlando for the same price as two of us to Honolulu. Andrea also informed us we were "pre-approved" for an add-on. Gee, thanks Mickey. But we decided we weren't up to putting down that kind of money right now, and hopefully someday we will stay here with the Disney points we already own. While I'm already itching to stay there, I don't think we'll make it back to Hawaii for at least a few years. I really don't think too many people will be disappointed in their stay there. I'll be anxious to learn more about the place after the opening, and I'll be sure to post some update information this fall, and if anyone is taking an upcoming trip I'd love to hear all about it!